For instance, "Diamond" and "Outliers" in single plot. "Diamond" and "MeanDiamond" both represent "mean confidence interval", but the latter can be used with parameters width and style. Same is true for "Notched" and "MedianNotch". 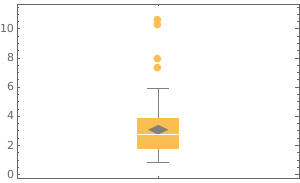 How can I specify the plot range of a BoxWhiskerChart?